Proper pruning of trees, throughout all stages of growth, helps them to grow and develop good shape and balance. Improper pruning can result in weak structure, imbalance, poor shape, and can contribute to tree illness. Younger trees are generally more able to recover from aggressive trimming, while more mature trees take longer to heal and recover. Makes sense right? They are much like humans. Consider the differing results when a 10-year-old child takes a spill, versus a 70-year-old person. The child will bounce back in a matter of minutes or perhaps days, while a more mature person may take months or years to properly heal, if ever! This is one important reason to pay special care and expense to younger trees and their proper branch development. DIY tree trimming may in fact cause more damage to the tree when done by a novice hand. Call on the experts as EnvisiaCare Tree Service to maintain your trees. 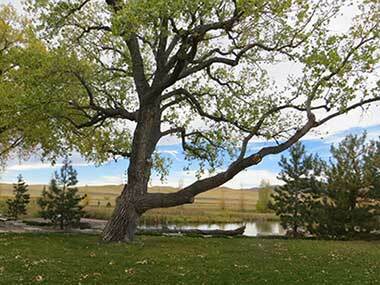 Knowing which branches to remove, the proper cuts to use for said removal, and the proper placement of cuts are all important considerations when cutting trees in Cheyenne. Understanding these principles makes the trimming process a positive growth experience for the tree. The converse is also true. When a cut is executed poorly it may result in a wound or vulnerability to the tree. Consequently the tree expends extra energy and resources in an effort to cover and heal the wound. This may include bark tears or cuts, leaving branch stubs too long or short (flush cuts), or careless nicks to the tree bark. Oftentimes such vulnerabilities leave pathways for disease and insects that are harmful for the tree. Our trained personnel takes great care to do no harm to trees while trimming. Be sure, and call in your local Cheyenne tree company. However, if you're planning on doing the work yourself, the following article by University of Minnesota Extension may provide some basics on how to properly prune your trees and shrubs. Raising up the canopy, or trimming lower branches, can make trees easier to work around and provide a nice shady spot to relax during hot summer weather. However, certain trees like pines need lower branches in order to provide strength to the base and to prevent being uprooted or toppled. Lightening up heavier branches can also help prevent branch breakage during heavy snow fall, wild Wyoming wind, and also helps to direct branch growth upward. Proper tree trimming makes trees happy and healthy and will also make your property look great! 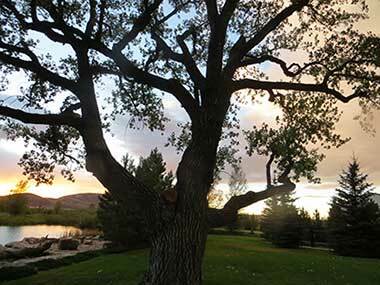 Call today or request a free estimate for tree trimming in the Cheyenne area!